The tour of Lambeau Field got wounded veterans out of the house and engaged with fellow warriors, limiting the common struggle of isolation faced by many returning from war. GREEN BAY, Wis. (April 10, 2017) – As a lifelong fan of the Chicago Bears, Anwar Berry is used to not liking the Green Bay Packers. 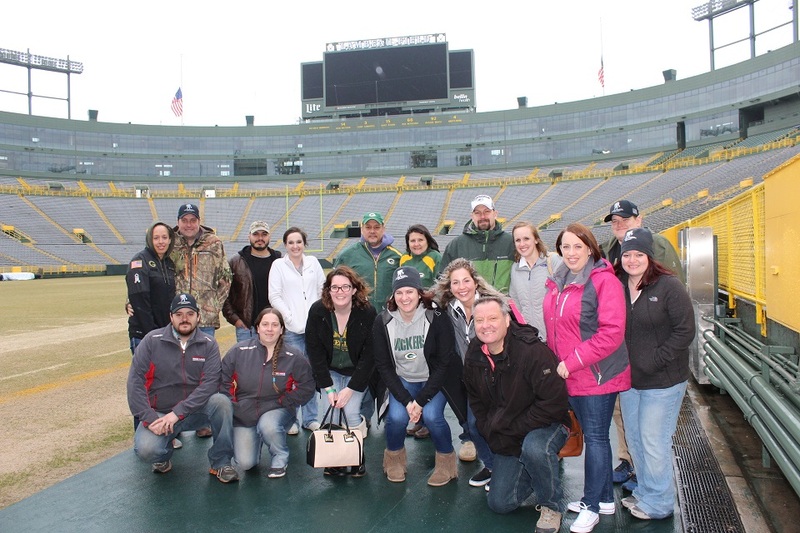 But a recent Wounded Warrior Project® (WWP) trip to historic Lambeau Field changed all that – if for only a day. Veterans and guests were given access to the field, player tunnel, and suites at one of the most-recognized sports venues in the world. The tour allowed them to connect in a relaxed environment – minus 81,435 fans – to support their recovery needs. Richard Dorr and Ken Corry are avid Packers fans. While both enjoyed walking through the 60-year-old stadium, affectionately known as the “Frozen Tundra,” they embraced the opportunity to connect with other warriors. “I liked going through the tunnel – the same tunnel the Green Bay Packers walk through,” said Richard, an Army veteran. Richard has been a fan at two Green Bay games. The WWP event, however, allowed him to see the stadium from a different perspective: from the ground, up. Richard met several veterans who were attending their first WWP gathering. WWP program gatherings offer settings that provide opportunities for injured veterans to form bonds. The programs assist warriors, their families, and caregivers with mental health, physical health and wellness, career and benefits counseling, connecting warriors with one another and their communities, and long-term care for the most seriously wounded. Ken said what he liked most about the tour of Lambeau Field – and other WWP events – is continuing to connect with veterans. “It was pretty awesome to be at Lambeau, but to engage with the other warriors was the best part,” the Air Force veteran said. “That part is always priceless. The tour of Lambeau Field got wounded veterans out of the house and engaged with fellow warriors, limiting the common struggle of isolation faced by many returning from war. It can be difficult knowing how to overcome that challenge and rekindle bonds similar to those formed in the military.